Can you guess what day it is? Uh, uh? Can you? Can you? 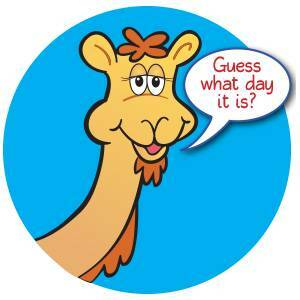 I admit, I’ve played my goofy camel card (think GEICO commercial) here at the office on more than one Wednesday. I love that camel! Today, I’m delivering news I’m hoping will make you happier than a camel on Hump Day! Part 1: Remember the blog where I asked how you used bingo daubers and binder clips? Well, these ideas and any others posted on that blog before March 10 are being evaluated for purchase. Each purchased idea earns a $20 gift certificate good toward the purchase of a book from The Mailbox. Part 2: In just a few more days, The Mailbox will release more than 20 new books, which include grade-specific publications! And yes, these books support and are labeled for Common Core State Standards. Part 3: If you don’t have a favorite idea for using binder clips or bingo daubers, that’s okay. Any favorite ideas shared on this blog before March 10 will also be evaluated for purchase! Yay Diane can’t wait until the new books come out and having our ideas evaluated. YAY. Here’s an idea most of our teachers liked. How about Seuss week we made a cute cat hat ! Picture a vanilla wafer stuck with a toothpick strawberry slice banana slice strawberry banana strawberry are you catching my drift! A great snack while you read cat in the hat and I thought of it myself! What a great idea, Melissa! And yummy, too. Thanks for sharing!